I love to use the computer after I’ve done a fresh Windows installation on my computer. It is fast and there’s no problem at all! Windows system stability is the most important. Whenever Windows got infected by a destructive virus that embeds itself to EXE files such as JambanMu, the best thing to do is to format the hard disk and reinstall Windows. There are around nearly 1000 executable (.exe) files inside Windows folder and if most of them are being infected by virus, I can guarantee that Windows won’t be stable anymore even after doing a Windows repair. Using an antivirus to disinfect the infected executable files doesn’t necessarily mean you can run it again because it may be corrupted. For programs that you are unable to run, reinstalling them multiple times will cause the stability and performance of it to drop. So, protecting Windows operating system files and also some common known folder in Program Files is very important in order to maintain stability. I stumbled on a free security program that is able to keep your operating system stable and protect important programs, documents and files from deletion. System Protect is a free and simple to use software that helps keep your Windows operating system stable by protecting them against accidental or intentional deletion by viruses, human mistakes or even from your kids. 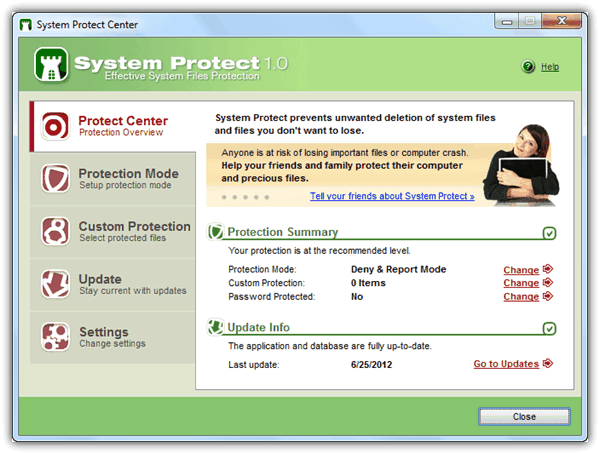 After installing System Protect, it automatically protects the so-called “system files”. The list of recognized and protected system files for Windows XP, Vista and 7 are in an encrypted definition file BIN_SPDATA.SDF located in the program’s folder. Any attempt to delete the system files that is listed under the definition will be instantly blocked and notified if the protection options are active. The good thing about System Protect is it only protects known system files. You can move or delete files in Windows such as winhelp.exe, hh.exe and etc that won’t affect it’s stability. But if you try to do the same for explorer.exe, regedit.exe, twain.dll and etc, it’ll be blocked and a notification window will appear. 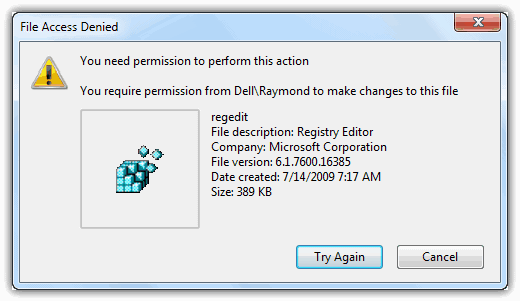 As a test, I tried taking the ownership of regedit.exe in Windows 7 and assigned full permission so that I can delete the file. 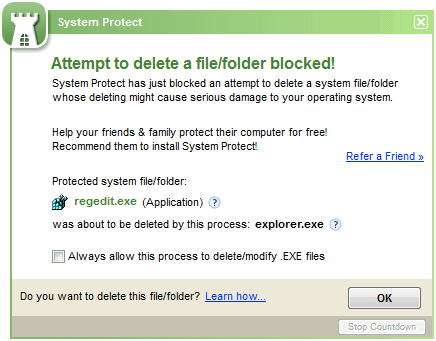 When I tried deleting regedit.exe, System Protect instantly notifies me that there is an attempt to delete the regedit.exe file and is blocked from doing so. Windows also reports that I needed permission to make changes to this file even though I have full control plus ownership. When you need to install Windows Update or any legitimate software that affects system files, you will have to temporarily turn off the protection or run System Protect in Install/Modify Mode(protection disabled). You can also manually select the files and folders that you want to protect from the Custom Protection tab. Do take note that if you have System Protect installed, it doesn’t mean you don’t need a real-time antivirus. System Protect only protects Windows files from being infected or modified by virus but it if a RAT (remote administration tool) trojan copies itself to Windows folder and set it to autorun, your computer is still compromised and can be accessed by the hacker anytime. Although Windows 7 already have a built-in protection to prevent system files from being easily deleted by assigning the read and execute permissions for users while only TrustedInstaller has the full control over of the files, it is still good to have a secondary protection in case if some smart virus manage to bypass the first layer of protection by Windows. It is possible to set a password for System Protect so that unauthorized user cannot disable the protection which is very useful for public computers in library, cybercafe and etc. System Protect can be installed and ran side by side with an antivirus software without problems. During testing, we did not notice any slowdown when System Protect is active and the memory usage is extremely low at less than 10MB in total. System Protect is free, works on Windows XP, Vista and 7 but do pay extra attention during installation as it prompts to install an unnecessary Web Security Guard Toolbar which can be prevented from installation by unchecking the two checkboxes. i will combine it with the mcafee that you gave. Hmm, this sounds pretty good. So this program is dedicated to defend the system files? That would be nice… Windows tends to be very fragile. My current security setup is Avast AV + Threatfire + Online Armor Free. I’m thinking System Protect might overlap with Threatfire (a program which basically monitors behavior and looks for suspicious activity). Ray, what do you think about this? with 3 people using there jump drives on this computer the Virus and Trojans they acquire from using university computers is vast.